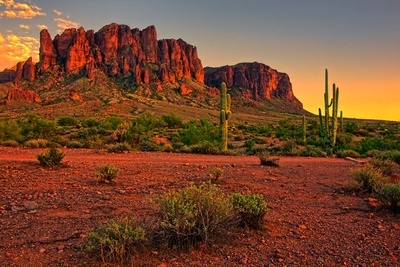 RVnGO is America's best marketplace to find RVs to rent in Arizona. Find your RVnGO! 36' to 40' Diesel with Slide. Hitting 37 miles east of Flagstaff, Arizona, the Meteor Crater is an impact depression about a mile wide, about 2.4 miles around and 550 feet deep. This natural wonder was created 50,000 year ago when a meteor hit the earth travelling at 26,000 miles per hour. It became a National Natural Landmark in 1967, has an RV Park about 1/4 mile from the site and is open year-round. The Meteor Crater Visitor Center situated on the north edge has guided rim tours, a big screen movie theater, information and displays about meteors, comets, space, space rocks and our planetary system. For more information you can visit the site's official website Meteor Crater. Swing by in your Arizona Class B RV rental to check out one of the coolest attractions in the area! Lake Havasu, dubbed "Arizona's Playground," is one of the nation's best water in the desert destinations. With 300 days of sunshine, 400 miles of coastline and 60 miles of navigable waterways, it is also home to the original London Bridge. Brought over in the 1960s, the bridge was rebuilt brick by brick and traverses the mouth of Lake Havasu. Most likely one of the few examples of when buying a bridge actually panned out. RVers in their camper trailer rental in Arizona can go boating, take part in water sports like wakeboarding, skiing and angling, or hop on an ATV for an outing into the encompassing desert. Find more details at Go Lake Havasu. The Colorado River seems to lose its way close to the Arizona city of Page; it almost doubles back on itself in a place called Horseshoe Bend. A popular attraction for visitors to marvel at the vivid colors from the mineralized water and striking canyon walls layered by eons of sediment. Check out the Horseshoe Bend Visitor Center for the best times of the year to visit and suggested hours of viewing to catch the most dramatic scenes. Dynamic at sunset, Glen Canyon Recreational Park is only 5 miles upriver, which is an easy jaunt to make in your rented RV! Not far from the famous landmark, Meteor Crater RV Park is a great spot for a camper trailer rental in Arizona. It is also close the various attractions in Winslow and Flagstaff. The RV Park has 65 accessible spaces, 40 of which are shaded full hookups with space for slide outs. Offices and amenities include Wi-Fi, guest lobby, outdoor games, horseshoes, laundry room, RV supplies, restrooms and showers, ATM, store, and a dump station. Near Lake Havasu and surrounding attractions, Campbell Cove RV Resort is ideal for an RV rental in Arizona, whether it's a Class A motorhome or nifty Class B RV. It has 100 accessible full hookup spots with space for slide outs. Amenities include a heated pool, spa, horseshoes, amusement room, outdoor activities, Wi-Fi, satellite TV, restrooms and showers, laundry room, and RV provisioning. Campbell Cove RV Resort is open throughout the entire year for your camper rental in Arizona! Near Lake Powell and the City of Page, Page Lake Powell Campground is the place for your trailer rental in Arizona. It has 105 accessible shaded rock destinations, 71 of which are full hookup locales with space for slide outs. Amenities include a play area, heated pool, spa, games room, outdoor activities, horseshoes, satellite TV, Wi-Fi access, restrooms and showers, laundry room, RV supplies, clothing and goods store, and a dump station for your campervan rental. Boasting the best rates around, check them out for a fun experience that won't break the bank. Yes, you read that right, Lake Havasu is known for its wild moments and fun atmosphere, their derby is exactly what you think it is. One of the biggest and most lucrative striped bass angling tournaments in the nation, the Annual WON Lake Havasu Striper Derby happens each May in Lake Havasu City. Amateur or experienced fishermen can participate with a lot of fun at the end of the Derby to wrap up. You're going to need a rented RV to do your best in the Derby and to sleep off the after party! As a foodie, you must visit Arizona to savor the Scottsdale Culinary Festival. The celebration happens annually mid-April and highlights 35+ restaurants, chocolate, wine and spirits sampling, a wide choice of foods from around the world, culinary demonstrations, special appearances by gourmet celebrities, a burger battle, live music on three stages, a family fun zone and a beer garden. Best of all, proceeds from the epicurean celebration go to support local arts programs. In Arizona, the sky is the limit to what you can do and explore, we just touched on a few spots and ideas for your RV rental trip. Book your adventure today on RVnGO and head out the wild west for a trip to remember!